● 2-4 capsules per day. ● 4 to 12 capsules per day. ● 1 to 2 capsules per day, with meal. ● 1 capsule per day at breakfast, with meal. ● 2 capsules if you’re above the normal weight. All of the products can be taken any time of the day. However, Laminine (original formula) is recommended to be taken on an empty stomach, before breakfast, and at bedtime. 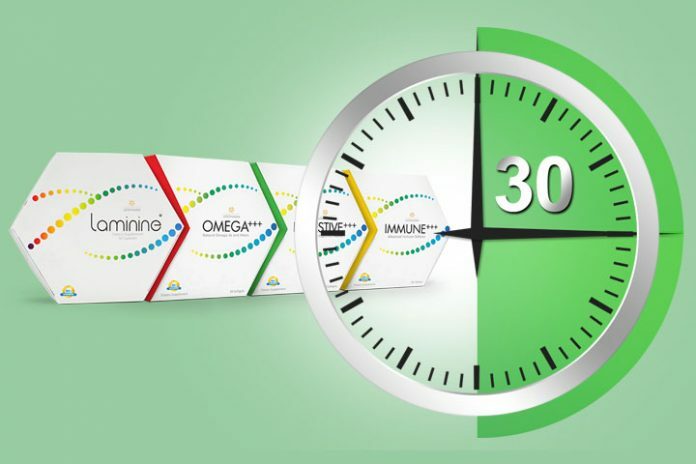 Laminine Omega, Digestive, and Immune plus are generally suggested to be taken during meal time with food, breakfast or lunch only. Digestive+++ should not be combined with any drugs or medicine. Laminine is safe in general, but you need to consult your obgynecologist before taking the product. Laminine contains eggs and those with egg allergy to it should avoid it. Is there the same amount of FAEE in Omega+++ as there is in the original formulation Laminine? No, the amount of the FAEE compared to Laminine Omega is much less. The Omega is actually intended as a supplement to Laminine (original formula), for those who have cholesterol problems, bones or inflammation. Is there testimonial laminine taking by still coma person till he/she conscious. can one take omega+++ and immune+++ at the same time? Yes, these are all food supplements and can be taken together. However, Laminine Omega and Immune should be taken with food or while having breakfast. Hi is laminine can work for my condition as my kidney spills protein while laminine has protein. The kind of protein Laminine is needed to help the kidney. Click here for suggested dosage for kidney problem.